Part of the appeal, for us, is the fact that there is just so much to do here. Within a three hour drive, we can experience mountains, lake, ocean, cities, other countries. And in considerably less time, we can be transported to the bucolic countryside for leisurely weekend drives that highlight the agricultural and small-town economies that give the Capital Region much of its charm. Case in point: Sharon Springs. 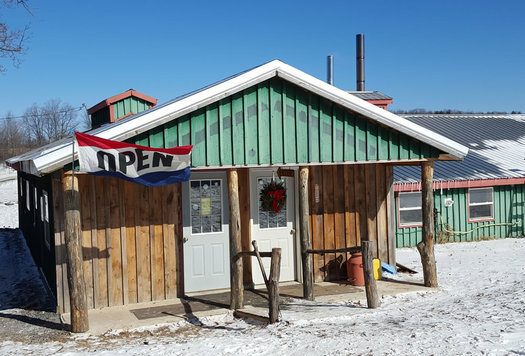 The town lies on the historic byway of US Route 20 and was once a hotspot for the out-of-towners looking for healing qualities in the town's natural springs. And there are plenty of farms surrounding the tiny town center that offer a plethora agricultural products that city-folk are more than happy to bring home. Like maple syrup. And really, what's the point of maple syrup if you can't have a good pancake to sop it up with? 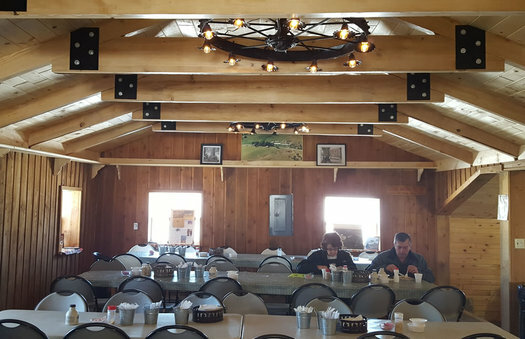 Thankfully there is a place where you can find a stellar pancake and top-notch maple syrup in quaint Sharon Springs: The Sap House at Stone House Farm. Just west of town, hugging both sides of a winding compacted dirt road, lies the farm, with the stone house and dairy barns on one side and a tin-roofed, green-clapboard sap house on the other. 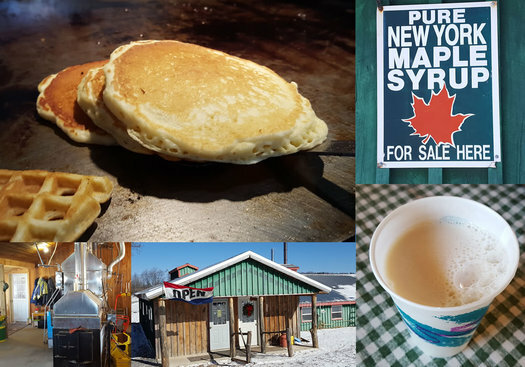 From February through April, the traditional span of maple season in Upstate New York, The Sap House opens its doors to visitors from near and far to take part in its pancake breakfast weekends. 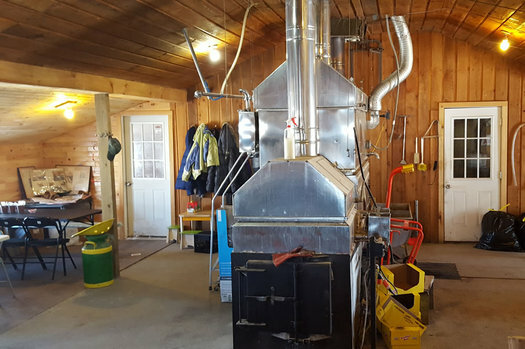 When the sap is flowing, the evaporator in plain view of the dining area uses wood heat to boil off water and concentrate natural sugars into golden syrup. Truth be told, what makes a great pancake usually isn't what goes in it, but what doesn't. Less is often more with pancakes, and keeping them simple -- like The Sap House does -- tends to lead to the best result. The real draw, however, is what you can add to your pancakes. 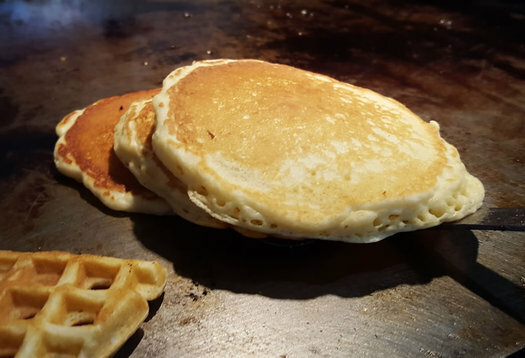 Pancakes, as good, hot, and fresh as they are, are simply a vehicle for an array of maple products you can top them with. Maple butter sits side-by-side with classic unsalted butter, and jugs of maple syrup are in no short stock. Not enough for you? Maple sugar is also available for a crunchy pancake topping or to sweeten your coffee. Pro tip 2: When you arrive, simply walk in and find a seat. Don't worry, Patti and crew will see you, and they will swiftly stop over to take your drink order and start you off on pancakes, etc. And when they see your empty plate, they just as readily ask if you are ready for more, which come hot off the griddle. (Nothing sits around here, becoming floppy under its own steam.) Pay when you leave, and be sure to bring cash and throw a few bucks in the tip bucket that hangs on a wooden post near the exit. 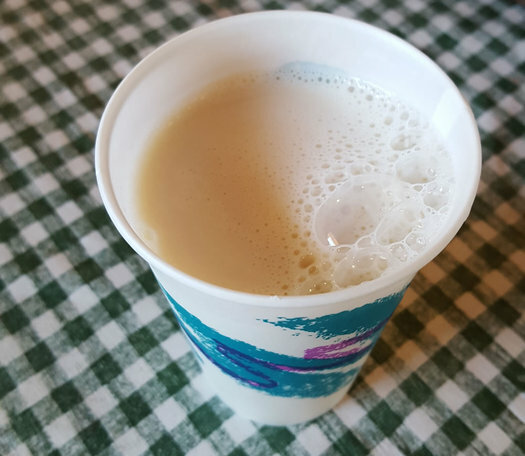 The best part is the entire pancake breakfast, which includes pancakes, waffles, sausage, an array of drinks (like coffee, tea, juice, and white or maple milk), and all the maple your mouth can handle, is only $6. If you were to ask for real maple syrup in a local diner, it might cost you $6 alone. As a recent commenter to this blog said, there is a bevy of good food to be found in Albany. I couldn't agree more, but sometimes, one needs a change of scenery and should travel farther afield to come across what makes living in Albany such a pleasure. Especially when it's maple season and there are pancakes to be had. There are pancake breakfasts Saturday and Sunday, 8 am-1 pm, through April. Now i know what tomorrow's breakfast will be! Love this place. Such a cozy atmosphere- you really can't beat it! Plus, maple cream. Not to mention, the house which is the farm's namesake is gorgeous, within view across the street. I recommend getting a tour here on Family Farm Day in August; the family story is wonderful, too. @Corinne -- I agree, the house is stunning. And the wagon wheel lights inside the saphouse are really charming. Definitely an experience in every way. Our 3rd time and each has been yummy..
Come with our Daughter and Son in Law..